There is nothing quite like the humiliation and shame of being cheated on. Everyone knowing your partner didn’t love you or respect you enough to be honest. The feeling that everyone else knew before you did, that they were with someone else. But there is also such sadness in her words. I too know the feeling of questioning your partner’s behaviour and being told you’re crazy and paranoid for suspecting them. In my case, I started to believe him. Maybe I was mad. There were no paparazzi photos of passionate kisses to confirm my suspicions – just a long stream of drunkenness and emotional absence, and tiny fragments of evidence that led me to believe that my then husband was having an affair with a young woman from work. The denials, which were contrary to my gut instinct, made me feel like I was losing my mind. Until the text message to someone else saying “I love you” was found. Then it was conclusive. 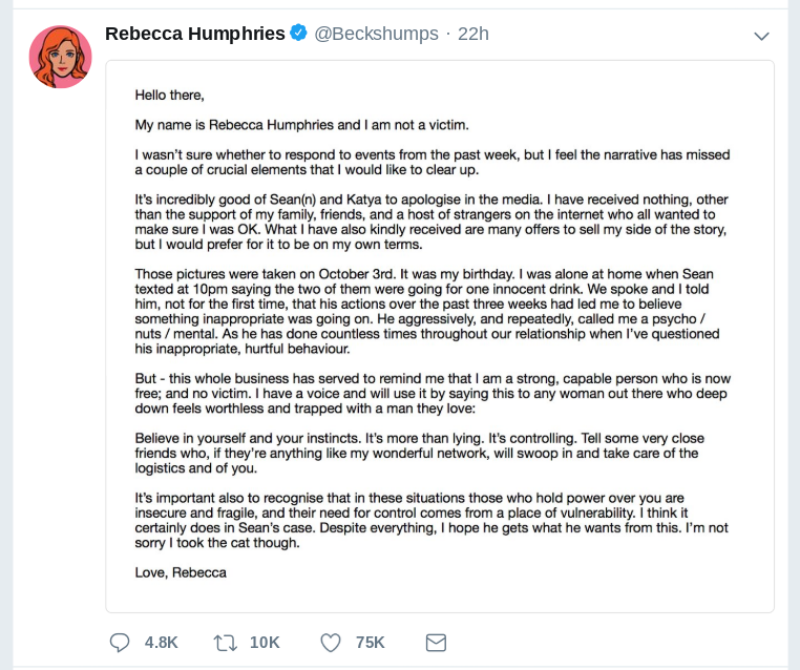 At that point, like Rebecca, I fled, and my support network rose up around me, somewhere to stay, somewhere safe to cry, somewhere to make sense of the strange new order of my life. To my surprise, when the shock subsided, a feeling of invincibility took over – I had survived what I thought was the worst thing that could happen and my instincts were right. I wasn’t crazy at all, I was vindicated and I felt powerful. I rebuilt my life, just me and my cat at first, later a new partner and then our children. Rebecca says believe in yourself and trust your instincts. She is not a victim. She is a strong, capable person. She will get through this, with her cloak of invincibility and her cat, and so can you.